To educate and inspire students to become highly competent osteopathic physicians and lifelong learners prepared to meet the diverse health care needs of tomorrow through innovative education, relevant research, and compassionate service. 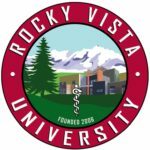 Rocky Vista University College of Osteopathic Medicine (RVUCOM) was founded in 2006 to educate osteopathic physicians and prepare them to meet the diverse needs of their patients. It is our goal and standard that upon graduation, our students will be qualified to enter any medical specialty. Our emphasis, however, is the training of students who are committed to entering community-based and primary care disciplines to meet the needs of those who are underserved or disadvantaged in Colorado, Utah, and the Mountain West Region. We are committed to producing graduates who not only are knowledgeable and skilled, but who also are ethical, compassionate, holistic, and patient-centered. It is our goal that all RVUCOM students will practice the traditions of osteopathic principles, philosophy and heritage and will become well-rounded physicians equipped to meet the needs of patients today and into the future. The RVUCOM-Southern Utah campus, located in Ivins, UT matriculated its first class in 2017. Suburban. Denver is the closest city for the Colorado campus; St. George for the Utah campus. RVUCOM is accredited by the Commission on Osteopathic College Accreditation (COCA) of the American Osteopathic Association (AOA). RVU has regional accreditation from Higher Learning Commission (HLC), a commission of the North Central Association of Colleges and Schools. RVU’s Surgical Simulation Center is accredited by the American College of Surgeons (ACS). The Colorado campus includes a state-of-the-art, 145,000-square-foot educational facility constructed to advance the education of RVUCOM students and graduates. RVUCOM has designed and equipped a standardized patient lab that is based on the requirements established for the National Board of Osteopathic Medical Examiners as well as the United States Medical Licensing Examination. An extensive simulator laboratory is available to provide students with the opportunity to develop knowledge, skills, competencies and confidence. The auditoriums, laboratories, and study and learning areas of the college have been engineered to develop a positive learning environment. The Utah campus features a new 104,000-square-foot medical education facility, including a full simulation center featuring an emergency room, OR, ICU, and labor and delivery suite. Numerous apartment complexes are available in close proximity of the Colorado campus. On-site, furnished apartments are available for students on the Utah campus. The design of the curriculum is based on a proven systems-based integrated academic model. 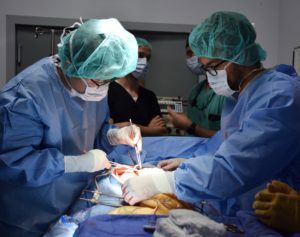 It emphasizes interdisciplinary collaboration, guiding students to develop a holistic, and more importantly, an osteopathic approach to medicine. In utilizing a systems approach to medical education, basic biomedical science disciplines are integrated with clinical sciences in a fashion that reflects clinical relevancy, rather than broken down into individual segregated disciplines. RVUCOM continually correlates basic scientific information and methodology with fundamental clinical application. Students are exposed to clinical settings in their first semester, which gives them the opportunity to prepare for the “real world” of medicine. We believe that by adding early clinical exposure and active learning in a team or small-group setting early in the curriculum, we will strengthen the students’ ability to think critically, solve clinical problems and develop the skills they will require to continue to learn throughout their careers. Professionalism and ethics are key components for a physician and are emphasized throughout the entire curricular experience at RVUCOM. Third and fourth-year students are placed at one of our regional centers throughout the state and region to ensure continuity and coordination of clinical education within RVU’s vast and growing clinical training network. The competency-based curriculum is designed to fulfill our mission of training students who are competent and ready to enter graduate medical education and training, with an emphasis on preparing students to become primary care physicians. RVUCOM has a dedicated faculty; established affiliations with medical centers, hospitals and health care systems; a structured and supported rural medicine program; and a mission to educate the finest osteopathic physicians possible. 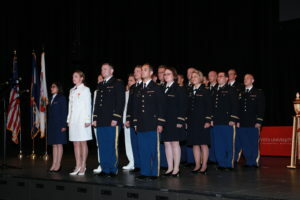 Educational Tracks offered in: Military Medicine, Global Medicine, Rural/Wilderness Medicine, Physician-Scientist, Academic Medicine and Leadership Track (Utah location only), Long Term Care Medicine Track (Utah location only) Urban Underserved (Colorado ONLY – pilot 2019) and Digital Medicine (anticipated pilot in 2020). The MSBS is a nine-month (30 semester hours) degree program designed to strengthen the academic background of qualified applicants who are seeking acceptance into graduate health programs, such as medical, veterinary, dental, physician assistant, or other professional programs. The MSBS currently offers a core curriculum in the Biomedical Sciences designed to prepare students to enter professional education and/or advanced degree programs in the biomedical disciplines. The MSBS aims at enhancing the student’s academic record and competitiveness of his or her candidacy for a professional or graduate degree. RVUCOM has an agreement with the Utah Rural Health Scholars Program to offer an early acceptance to exceptional candidates in the Rural Health Scholars Program at Southern Utah University and Dixie State University. RVUCOM will admit students attending CSU’s MSBS program upon the recommendation of the CSU Program Director and Faculty and approved by the RVUCOM Admissions Committee. RVUCOM will admit students attending the Master’s of Biomedical Sciences program at Regis University upon recommendation of the Regis Program Director and Faculty and approved by the RVUCOM Admissions Committee. RVUCOM has entered into an agreement with Western Colorado University to offer an early acceptance to exceptional candidates recommended by Western Colorado University. Applicants must be U.S. citizens or permanent residents. Supplemental applications will be sent only to candidates possessing a minimum of 3.00 science and cumulative GPAs. A composite score of 500 or greater is required for the MCAT. A letter of recommendation from a physician (DO or MD) is required along with a committee/advisor letter (two letters from science instructors may be substituted in the event the university does not have a pre-health advisor or committee). RVUCOM seeks well-rounded, service-oriented individuals who can complete an academically rigorous curriculum and will help the college fulfill its mission. RVUCOM assures equal opportunity to all students and applicants, regardless of gender, age, race, color, non-disqualifying disability, religion or creed, sexual orientation, or national or ethnic origin to all the rights, privileges, programs, and activities generally accorded or made available to students at the school, and does not discriminate in administration of its educational policies, admissions policies, scholarship and loan programs, or other school-administered programs. As RVUCOM reviews candidates on a rolling-process, it is in the candidate’s best interest to submit their AACOMAS application as early in the cycle as possible, and at least four weeks prior to this school’s latest filing date. Please note that all interviews may be concluded and seats filled prior to the application deadlines. Applicants must be U.S. citizens or permanent residents. Supplemental applications will be sent only to candidates possessing a minimum of 3.00 science and overall GPAs and a composite score of 500 or greater for the MCAT. A letter of recommendation from a physician (DO or MD) is required along with a committee/advisor letter (two letters from science instructors may be substituted in the event the university does not have a pre-health advisor or committee). RVUCOM seeks well-rounded, service-oriented individuals who can complete an academically rigorous curriculum and will help the college fulfill its mission. To be eligible to receive a supplemental application, candidates’ AACOMAS application must reflect a minimum 3.0 science and overall GPA and a minimum cumulative MCAT score of 500. The supplemental application fee is $60. The fee is non-refundable and non-waivable (except if the applicant provides documentation that they have been awarded an AACOMAS fee waiver). A minimum of a bachelor’s degree from a regionally accredited U.S. college or university. Waiver conditions: AACOMAS waiver; US Armed Forces Veteran or active duty (applicant or spouse of applicant). Screened applicants – please include criteria (Required): To be eligible to receive a supplemental application, candidates’ AACOMAS application must reflect a minimum 3.0 science and overall GPA and a minimum cumulative MCAT score of 500. Low-stress, 35-minute interview with two-member panel. Interviewers have access to personal statement, supplemental application, and letters of recommendation. Academics have been pre-screened and will be evaluated post interview by the admissions committee. Deferred entrance requests considered: Yes.